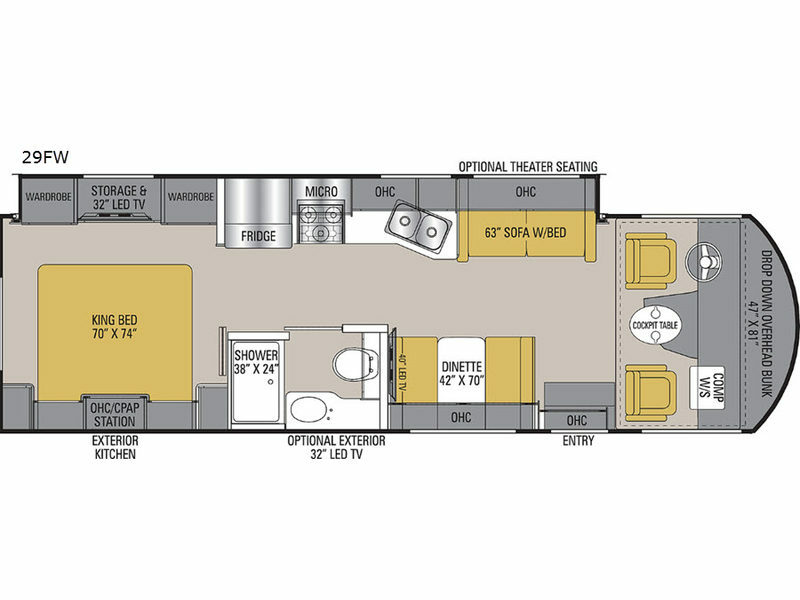 With this Mirada being the smallest motorhome of the series, it is the perfect "couples coach" even if you like to invite overnight guests every once in awhile. There is a king bed in the rear bedroom for a good night's rest with a 32" LED TV for some entertainment before bedtime. Outside you can enjoy the great outdoors, just open up the 20' power awning, add a few camp chairs and watch the big game on the exterior TV if you decided to add that option. The chef in the family will enjoy cooking up amazing meals either on the exterior kitchen or inside with full amenities. You can relax on the sofa bed or dinette, choose an optional drop down overhead bunk, and enjoy new scenery every chance you get. Take a look, you will be pleased you did. Each Coachmen Mirada is made with Azdel composite sidewalls providing strong and lightweight walls for years of enjoyment, an elongated wheelbase which distributes the weight evenly throughout the unit for better handling and a smoother ride, and spacious exterior storage which allows you to bring everything you need. You can also easily navigate with the backup monitor and side cameras. Inside you will find solid surface kitchen countertops for a stylish look, premium linoleum throughout for easy clean up, stainless steel appliances, a Wifi Ranger, solar prep, and much more! 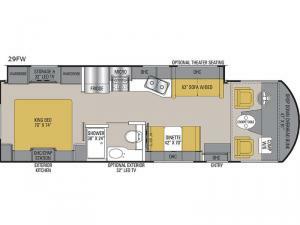 Come take a look at a Coachmen RV Mirada class A gas motorhome today! Shower Size 38" x 24"
Basement Storage 131 cu. ft.